The Virgilbag is dead and it's never coming back. But we were sent this story and we liked it, so here you go. My buddy Jose (pictured) and I had a strange interaction with Virgil January 2011 at the Los Angeles WrestleReunion. 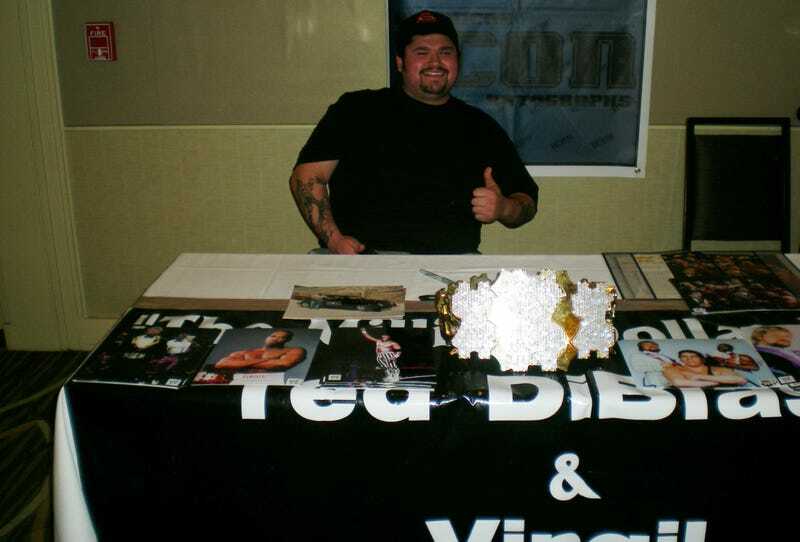 We entered the lobby to the meet-and-greet area where we could meet the wrestlers, and Virgil walks up to Jose and asks him to watch his booth for a couple of minutes. He said he had to take a piss. Not left much of a choice, we watch his booth and merchandise. Forty-five minutes later, Virgil comes back with a bottle of Coke and a bag of M&M's, and very smugly thanks us and offers a picture with him for a "discounted price."